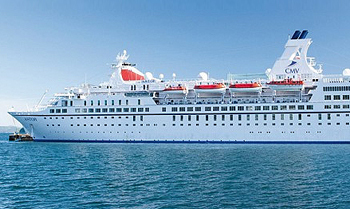 LATEST NEWS: Astor is leaving the Cruise & Maritime Voyages fleet. After six years of introducing cruisers to the coast of Australia from Fremantle and Adelaide, Astor will sail Australian shores with CMV for the last time in March 2019. Spend Australia’s summer aboard Astor exploring the character-filled coastal towns and rugged natural landscapes of the southern and western coastlines of Australia. Predominantly cruising from Adelaide and Fremantle (with a handful of Sydney and Auckland departures in the mix), there are a number of shorter voyages of one to four nights for those want to give cruising or the Cruise & Maritime Voyages experience a try. Alternatively, cruise up to 11 nights to experience the highlights of Australia’s coastline and even make your way for a relaxing, cultural break in Bali. Looking for an even longer getaway? Astor‘s voyages to and from Australia range from 20 to 55 nights and can take you on a discovery of Africa, the islands of the Indian Ocean, or even the Panama Canal. View all Astor cruises or view more options for Cruise & Maritime Voyages. Astor has seven passenger decks and her wide range of public facilities include the impressive Waldorf Restaurant offering a traditional two sitting fixed time dining option, you will also have the chance to dine in the intimate Admiral’s Salon (Asian Fusion Cuisine) or the Commodore’s Salon (Italian/Mediterranean Cuisine) dining rooms at a small additional charge. As an alternative, the more informal Übersee Club Bistro. There are five lounge areas – the theatre style Astor Lounge, for some truly sparkling entertainment from the wonderful show-team; the elegant Captain’s Club, a perfect venue for pre-dinner cocktails; the intimate Hanse Bar which leads onto the stylish Sun Terrace, with wonderful panoramic ocean views; and the Poolside Bar. On board Astor, enjoy a wide range of very comfortable lounges and stylish leisure facilities to make your voyage a truly relaxing and enjoyable experience with outstanding service from the attentive crew. From the moment you step on board, the choice is yours to join any of the many activities on offer or simply enjoy the luxury of being able to do absolutely nothing. The ships daily programme will be delivered to your cabin each evening, outlining the events of the following day. Maybe join the fitness team on the Sun Deck for a jog or a walk, yoga or an early game of deck chess. Later in the day, perhaps listen to a speaker or learn a new skill from one of our arts and crafts specialists. And, on those sunny tropical days, relax by the pool with a good book and perhaps a refreshing cocktail. And when the sun goes down in the evening, pre-dinner drinks are served on the Sun Terrace with the view of the ocean and the Captains Club where your favourite drink is ready for you. Food is always one of the many highlights of cruising. Whether you are enjoying a pool deck buffet, a relaxed lunch in the Übersee Club or dining in the magnificent Waldorf Restaurant, our superb chefs on board Astor will not disappoint you. You will also have the chance to dine in the intimate 20 seat Toscana or Romantic speciality dining rooms at no additional charge. Your evening meal starts with an appetiser followed by a delicious soup and a light salad. Main courses range from appetising seafood, mouth-watering rack of lamb, medallions of beef, escalope of veal, chicken chasseur, Italian pastas, Asian stir fries, and traditional roasts  and that’s just a small selection of the array of dishes available for you to savour. Tasty vegetarian meals to tantalise your taste buds are featured on every menu, as well as healthy options. Finish your meal with a cheese platter, fresh fruit or, if you are unable to resist, try one of the delicious desserts. The variety is endless! A selection of fine wines are available to complement your meal. Food is always one of the many highlights of cruising. Whether you are enjoying a pool deck buffet, a relaxed lunch in the Übersee Club or dining in the magnificent Waldorf Restaurant, our superb chefs on board Astor will not disappoint you. You will also have the chance to dine in the intimate Admiral’s Salon (Asian Fusion Cuisine) or the Commodoore’s Salon (Italian/Mediterranean Cuisine) dining rooms at a small additional charge.